The reality is in fact far different. Yet despite pointing the facts out left, right, centre to anyone who’ll listen, it still keeps cropping up. So, if you get involved in a “robust” discussion about the contribution of cyclists to the upkeep of our transport and health systems, here are a few handy points to throw back. Note: as many of you know, I don’t like the terminology “cyclist”; I’d rather think of “a person who happens to be cycling right now”. It’s potentially another argument against dividing people into those who pay and those who don’t. So, where possible, I have avoided talk about “cyclists” here. First it’s useful to know what transport dollars are actually spent on. If we ignore public transport services and facilities, the majority (~52%) of road construction costs are actually spent on maintenance and renewals to repair worn out roads (although RoNS are trying to do their darndest to steal from this bucket of money too). The damage to roads from vehicles is roughly proportional to the weight on each wheel to the fourth power (it’s complicated by axle configuration, but let’s not go there). In other words, a 2 tonne 4-wheel car typically causes about 10,000 times more damage to a road than a 100kg bike and rider on two wheels, while a 30 tonne 18-wheeler truck might do more than 1 million times the damage. So basically a fair proportion of transport costs are simply covering the ongoing effects of cars and trucks on the roads; any damage to roads by bikes is negligible. The balance is then spent (in theory) on the best solutions to resolve the various transport problems of congestion, safety, environmental impacts, etc. However, no-one said that the best solution was necessarily one based on who contributed the most for it. For example, the most cost-effective solution to dealing with congestion somewhere may be to provide good cycling alternatives, rather than increase road capacity for motor vehicles. OK, where does the money come from? A large chunk of the transport money comes from petrol taxes, road user charges (what truckies pay), and motor vehicle registration fees. There’s also a small but growing amount coming from general taxation (e.g. 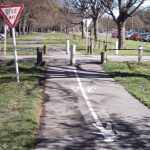 anything you buy with GST on it) – update: and the new $100 million Urban Cycleways Fund is completely funded by general taxes, not road revenue. However, when it comes to local roads (where most people cycle) about 50% is paid for by local Council rates (in larger places like Christchurch, the proportion is typically a bit higher). In other words, anyone who owns or rents a home (i.e. most adults and by implication their dependants) is contributing to the transport provision in their area. Most cycling infrastructure costs considerably less than half the cost/km of equivalent motor vehicle infrastructure, so I think that even those who don’t cycle are getting a pretty good deal out of that. I’ve heard a number of people use this argument: “as well as a bike I also own a car, therefore I do contribute to transport costs for cycling.” Well, it’s partly correct… remember that a large chunk of your petrol dollars are simply going towards fixing the roads that you damage by driving around. However, probably like me (also a car owner), you feel that a greater proportion of the balance should be spent on non-motor vehicle solutions to congestion, safety, etc, and that’s a perfectly valid viewpoint. Now, what about ACC? Well, cycling injuries are covered by either Earner Levies (paid for by everyone who works) or the Govt’s Non-Earner Account (paid for by general taxation). So if you are working or paying GST, you are already contributing to the treatment costs for you and your dependants. So why do motorists have to pay an additional levy? Because they cost a lot more – on-road cycling accidents cost ACC ~ $10 million/year compared with >$350 million/year for motorists. A more fruitful idea could be to simply add a levy onto each new bicycle imported and sold in the country. With over 200,000 bikes arriving each year, a (say) $20 levy would raise an extra $4 million a year. That’s not actually a lot, considering we already spend about $15-20 million/year (c.2013) nationally on walking/cycling facilities and that hardly goes anywhere near what is needed (certainly wouldn’t pay for $69m of Chch cycleways in a hurry…). But maybe if it was ring-fenced for cycling and driver education and training initiatives (like these), it might be quite a useful outcome (motorcyclists have done something similar with an annual safety levy). And it would have the distinct advantage of demonstrating a direct payment link for the “cyclists don’t pay” hardliners. I haven’t even started to get on to how people who cycle also typically save the country in so many other ways economically, be it health, environment, oil imports, etc (and to be honest, those points can be a tough sell to the die-hard car-lover). But even with the above points, hopefully you can nullify the “cyclists don’t pay” side-tracking and get back to the real debate about how to provide for a better cycling environment. You do all of us people who sometimes cycle a real favour by providing the facts to gently persuade those with an open mind. Thank you. Not quite. Cycling injuries that involve motor vehicles on public roads (including when a cyclist crashes into a stationary motor vehicle) are motor vehicle injuries, which are funded by the motor vehicle account. The motor vehicle account is funded by petrol levies and vehicle registrations. So, in one sense, you have car/cycle accidents being funded by car users but not necessarily cycle users. I’m not sure if this is a big deal, and I think it’s arguable that cost of car/cycle accidents are probably more expensive because a car was involved. Some cycling injuries will count as work-related injuries, though this is probably rare and also quite reasonable those injuries are paid for by the work account. Fair comment Simon, I glossed over that distinction. My own (Transfund) research on cycle-only crashes, using ACC data about 12 yrs ago, found that cycle-only on-road crashes outnumbered those involving a motor-veh by about 3:1 or 4:1 – a lot of gravel, poles and other cyclists/pedn’s/animals we have managed to hit over the years! When we factor in that the fault in ~2/3 of cycle vs motor vehicle crashes are attributed to the motorist, then that suggests perhaps ~10% of cycle crashes are funded from the motor veh account through no fault of the motorist. I would be interested in a further brake down of the motor vehicle accidents with same analysis done for motorbikes. As a rider the ACC levy feels extremely unjust and I am reluctant to take a politicians word that it isn’t. some facts and figures would be interesting to quite a few of my 2 wheeled (motorised) colleagues. However when a bicycle hits a stationary car (parked) – the car was probably parked in a space funded by council rates (i.e the car parking space was subsidised by those who chose to ride rather than drive). 2) The relative cost to the Health Care system cyclists to non cyclists is statistically significant. Each cycle commuter saves the tax payer about $10 per km traveled per week. There needs to be a campaign – Cyclists are motorists & motorists are cyclists. The dominance of cars causes cities to be spread out, so increasing travel distances, another price paid by cycle users. Cycling reduces costs for car users by reducing congestion. 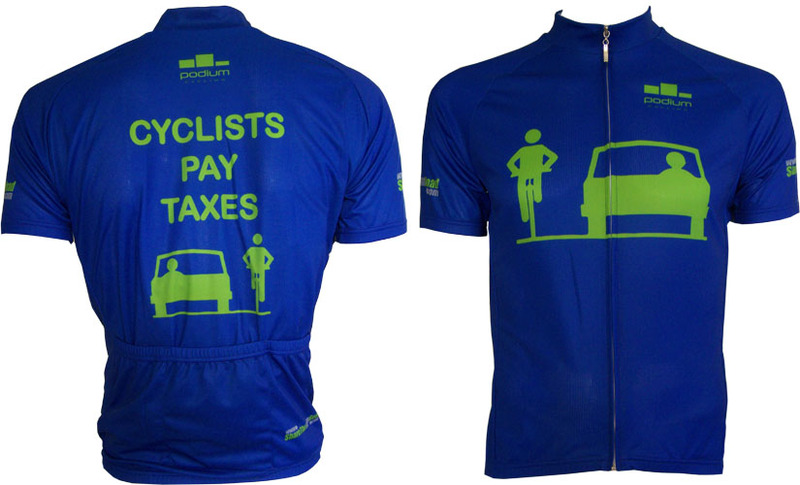 Sounds like cyclists should not pay fees, they should be paid!! Robbie – your GST argument could only be invalidated by encouraging motorists to drink coffee too! Maybe we could start selling coffee, like proper coffee, at service stations, along with pies and cakes and such. This way we could invalidate your argu…. Oh wait, silly me, that would never work. I want to see pedestrians start paying road tax. All they do is get in the way of my car. I could drive to work so much faster if I didn’t have to stop at those pedestrian crossings and wait for them as I make a turn at the lights. Arghh. Don’t get me started. Not only are the pedestrians not paying road tax, they are not safety conscious enough. Given the number of pedestrians hit by cars in this country, a compulsory helmet law for pedestrians ( especially children) is needed now!!! I think we would all be better off to have separated roadways for pedestrians only! Let’s do it. Let’s get the government to……..
oh wait, we do have separated walkways for pedestrians…. on second thought, forget my rant – how about cyclists and car drivers start being more considerate of pedestrians – no matter if they pay their road tax or not – and we can all get along getting around. Hmmm… If I bought an electric car I would get a subsidy, but I”d be using the road. Probably if I crashed and it made the paper there would be lots of comments about how I wasn’t paying my way in driving an electric car… Not. Pedestrians don’t pay road user fees, but they get whole sidewalks made for them – how come these people don’t carry on about walkists? Let’s face it, there is something about a person on a cycle that makes some people in a car forget their humanity. I think more research needs to be done. Do you all hate my freedom? I can just get on my bike and ride! Are you threatened by my little legs pumping up and down? Do you just really hate how I’m leaning forward? Does it look aggressive? Why did you run over my kid on his way to school in his little uniform with his little back-pack on… and he was going straight through the intersection with the right of way? And why did you go on without stopping to see if he was ok? I’m just wondering. What about those skinny tires and the flighty handlebars makes you hate me while I’m out there in the wind and rain and you are sitting comfy in a car? Why will no jury convict you for “not seeing” me and breaking me to bits with your car? I’m not sure it’s simply because we’re cyclists that instills in some people hatred and aggressiveness. 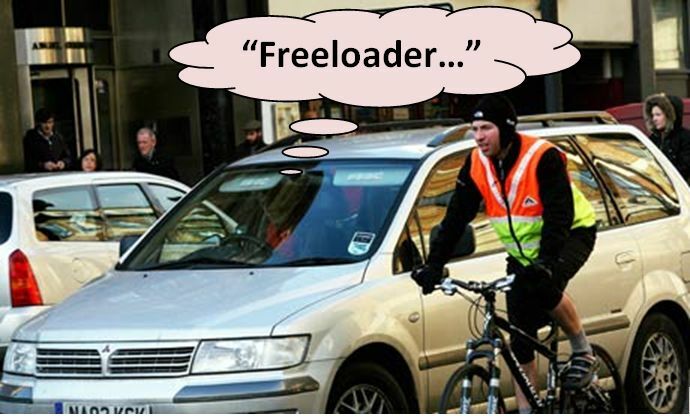 I think it’s mostly as a result of intolerance, and the belief they shouldn’t be held up, but the fact that some cyclists don’t obey rules and we are all deemed to be freeloaders doesn’t help. I’ve seen just as many motorists (some of whom are usually really mild-mannered) turn into aggressive and intolerant monsters (and I’m no angel in this respect, but am better these days) when they are behind the wheel and some other motorist makes a mistake. It’s something about our psyche, I think, but I don’t know why. Just to be clear, I’m talking about the average motorist. Those like the motorist who hit your little boy and failed stop, I can’t understand the mindset of people like that. I’ve had a few try and purposely swerve to cut me off. I guess these are the same people who would attack a gay person just because they’re different. The only thing I can put it down to is intolerance. BTW, you sound like a really nice person, who, considering what has happened, has every reason to feel bitter. But, you’re not in the slightest, based on what you wrote. Its as simple as this -I’ll never pay tax on my bicycle- I worry about these articles because they give impression its ok to even entertain this , I say this without swear words, but if you can read between the lines you might feel my furious anger at this very concept, and you can imagine the words that accompany that feeling.- I will never pay and you (metaphorical statist government lover and freedom hater) have no right to even ask such a thing you whoever you are!I would sooner pay for you toilet renovations than tax on bikes.I will never pay and we will never pay and biking will continue to be free, biking free for you and for me and thats the end of the issue- everyone who thinks otherwise is deluded, and should be ignored and disregarded from humanity as whole, worthless tax promoters.This world is free unless we allow them to ruin it for us, I’ve had a enough damn it!I’m not allowing them a choice here its my bike – my body – if I choose not to be a fat slob driving a car – if I choose healthy lifestyle and not to add to the carbon footprint fogging shighting up the air we breath then I should be rewarded at least with my freedom.Thats all I ask, to left the hell alone, to be human and to be left the hell alone to ride my bike to do my things without being told what I can and can’t do after all I’m an adult and I’m not beholden to anyone.I’m a free living human being and the worlds as much mine as it is anyones. Cyclists are a net external economic benefit to our city. Lots of people know this to be true. Its just a small vocal minority who like to stir things up. Wish people could see all the smiles from pedestrians I see when I’m cycling, and the thank yous, pleasantries we often share as we pass. Times they are a changing. Those who are not mobility impaired, who choose to spend their entire lives encased in a hunk of steel complaining about others, complaining about petrol prices, parking subsidised by our rates, motorways subsidised by our taxes, making the city less accessible to those who are mobility impaired, complaining about those who make the world a better place…… can continue doing so. They will just have to learn to start paying their true costs. Sometimes I cycle, sometimes I take the bike on the bus, and if I’m with someone whose mobility impaired I’ll take them in the car. Choosing to do so for years means I save this country a fortune in many areas especially by being able to afford to care for our family of all ages rather than grovelling to the state cap in hand. Look at all the benefits of cycling, you’ll be amazed.